Hey, everyone! I know fall has officially started, but here in the Big Apple it's still ridiculously hot. I'm talking '86 degrees' hot. It probably has something to do with all of the tall, metal buildings, but either way, there is no way I've been able to dress in sweaters and scarves. So, I've had to get creative with my fall inspired outfits. By creative, I mean outfits involving burgundy...and a lot of it. If you've stuck around here long enough, you know I never curl my hair without my Remington TStudio Thermaluxe Curling Wand. These curls are seriously my favorite. Ask any of my friends! Whenever I curl my hair, I use this wand. 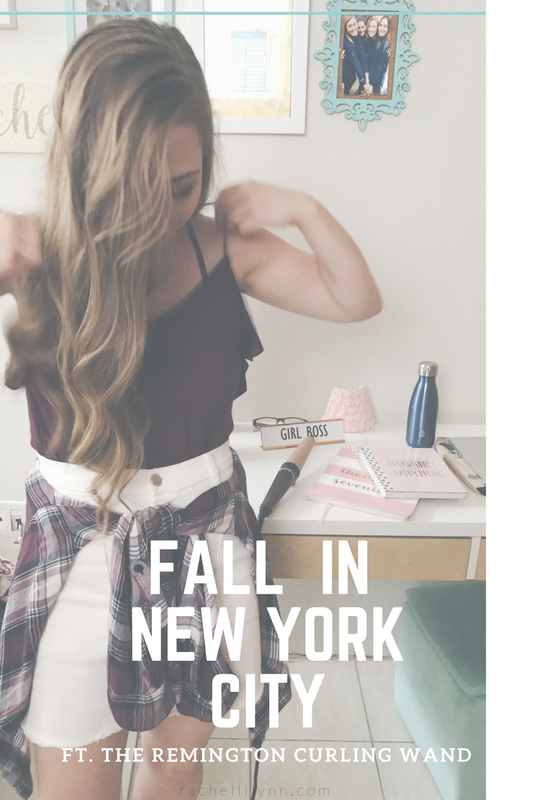 So there's no surprise it's my go-to fall curling wand of choice. Your girl knows what she likes. Disclaimer: This post has been sponsored by Remington Products. All thoughts and opinions are my own. Just look at those curls! They're the perfect "I want to look put together, but not like I'm trying too hard" curls. What a mouthful. The first stop on our fall adventure was Grand Central Station. We had a few errands to run in the area and naturally had to take a second for a photo -op. We were literally racing down the steps, on the way to catch the subway, when we (and by 'we' I mean my roommate, Kayleigh) realized how perfect of a place this was for pictures. I've raced past this spot several times, without even taking a second's thought, but there's a reason why so many movies and scenes are set in this beautiful space. Take Gossip Girl! The opening, iconic scene with Serena was filmed in this beautiful space. Through the humidity of the subway and the rush of the crowd, those curls still manage to bounce back! When a New Yorker, young or old, has somewhere to be, there's zero chance little 'ole me with my iPhone is going to hold them up. After our detour at Grand Central Station, we quickly made our way to the wonderful world of Dō. For those of you who haven't heard of this magical place (featured thousands of times on INSIDER videos), it's an ice cream-esque parlor. Plot twist: instead of ice cream, they serve cookie dough. (You definitely didn't see that one coming.) They have flavors ranging from birthday cake to snickers to brownie batter -- YES, BROWNIE BATTER. To top it all off (or hold it all up), they have pink vanilla flavored cones. Fam, if you ever find yourself in New York City and you enjoy the taste of cookie dough, but your mother always warned you against eating the entire batter raw (weird. ), go to dō. Dō it. The only caveat is that it's crazy busy on the weekends. Are you shocked? People like cookie dough. A lot. PRO TIP: Go on a weekday. Avoid the weekends. The line does, indeed, stretch across the street and down the block. For the longest time, I had no idea that Washington Square Park existed. I knew there was a mysterious place somewhere in Manhattan that housed a beautiful triumphal arch and that Hilary Rushford took the most ADORABLE blog pictures at this location, but that's pretty much all I knew about it. In fact, it was only last weekend while I was exploring the city with my friend that we stumbled upon this wondrous place. As soon as you walk in there were performers everywhere. We grabbed the nearest bench and listened too all of the different sounds as twilight turned into nightfall. NYU's campus does happen to be right around the corner. On this particular day fall day, though, we were milling about with at least a hundred other people. Someone somewhere was making those huge bubbles, which floated lazily into the sky. My roommates and I were admiring one that had wandered close to us when an angry man in a suit went out of his way to stomp by, kick out his foot and POP THE BUBBLE right in front of our eyes. Swear to God, I about to take a picture of the bubble when this man stormed over! The only proof I have of the beloved bubble's short life is a picture with the bottom half of his leg. New Yorkers, man. In commemoration of every blogger in NYC ever, we decided to have a photo shoot. For the most part it was us, trying to figure out what to do with our hands while looking off in the distance or smizing at the camera, inadvertently entertaining every onlooker in the area. Professionals all the way. I don't know the exact idea I had in my head of what it would be like to have a photo shoot in the park, but I definitely hadn't envisioned a bright orange construction vehicle as the unsung hero of the day. Life is mysterious. Bright eyed and innocent New Yorkers, amazed by every sight and sound. I don't know how it's possible, but I think my hair looks even better when it's up in a pony tail. There's only one way I'm getting those curls, so thank you, Remington! We finished off our first fall adventure wandering through Greenwich village and evntually finding our way to a happy hour full of daiquiris and guac. There are some days when New York can chew you up and spit you out, but then there are other days where bubbles float around you, musicians do their thing and plenty of memories are created. If there's one thing I know about my time here in NYC, it's that the streets have not seen the last of my awkward self. Only time will tell when I shall strike again. Love this look! Wish I had a Remington style wand to create those curls, so pretty! Looks easy and glam in minutes! I have been searching for some good quality iron and curler for my hairs which couldn't make my hair rough and dry and upon your recommendation I am going to buy the both from Remington store. Super cute day! Your hair looks so cute in a curly ponytail! Your hair is fabulous! The curling wand is the best invention ever lol. I especially enjoyed this post. I grew up in New York and this was a fun ride down memory lane. Looks like fun! And your outfit is so cute! You are so cute! It’s still hot here in Texas, too... 86 degrees exactly. Your hair stayed PERFECT! First, your hair is GORG! I absolutely NEED that wand! Second, I saw that 'ice cream' and I KNEW It was from that cookie dough place! GAhhhh! I need that in my life as much as I need that wand!